(Left) Business and life partners Edward Crouse and Marie Stitt; (Right) the caffè corretto—a duet of frozen Montenegro amaro and espresso shots—is shown here with lemon pound cake, overlaid with crests of toasted meringue. The only remaining vestige of The Distinguished Gentleman—a bygone barbershop at 11 Cannon Street—is the sage green and white flooring. 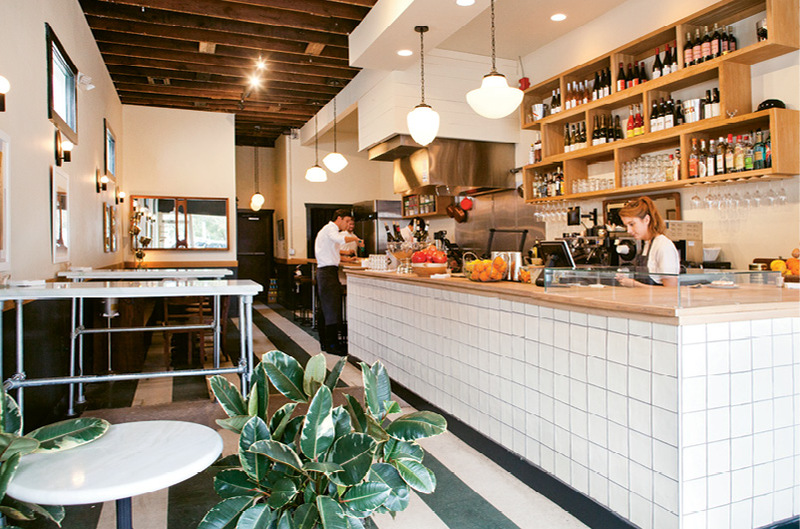 What now inhabits the Cannonborough single-story is Babas, a European-style all-day café. At first glance, that rough-hewn linoleum, stripped down in spots to bare concrete, suggests an unfinished quality, reiterated by the exposed ceiling beams and snaking insulation. But these aesthetics are deliberate, adding up to an acquired rusticity for the old-world vibe owners Edward Crouse and Marie Stitt sought to replicate. The 750-square-foot space is a pastiche of natural materials and antiques: vintage rattan and wooden chairs, a 100-year-old church pew, handmade ceramic bar tiles, and a snug quintet of marble pedestal tables. The white oak bar top—formerly a hurricane-felled tree, salvaged by a woodworking friend—is illuminated by reclaimed schoolhouse light fixtures, each a different size and shape. Altogether, the assemblage conveys an air of eclectic nonchalance that works—the kind of easygoing temperament found in a sidestreet Parisian café, or a tiny Piedmont town’s local bar, where neighbors can pop in for a pastry in the morning and a tipple at night. The interior of Babas is a mix of antiques and natural materials. Charlestonians have caught onto this sensibility in the five months since Babas opened. During breakfast, you might catch patrons in sport coats or pearls, Carhartt beanies or tattooed sleeves, all queuing for their a.m. caffeine boost. Those in an indulgent mood might opt for the peanut milk mocha, or any one of pastry chef Amanda Plunkett’s inspired confections, like the lemon pound cake embellished with an epaulet of meringue peaks, or the sliced brioche coated with house-made marzipan and toasted pecans. Come sunset, Babas shifts to highlight its true forte: aperitivo hour. A cultural cornerstone throughout Italy, aperitivo takes place post-work but pre-dinner, prime time for spritzes and salty snacks. Crouse and Stitt grew fond of this tradition when they first met, during a Slow Food program in Pollenzo (an hour south of Turin). Their favorite nearby watering holes offered a convivial atmosphere, along with menus to whet the appetite. Babas is a faithful homage, modernized for the gastronomically inclined crowd Charleston has in recent years quickly amassed. This epicurean class wants their natural wines funky, their cocktails calibrated, and their eats equal in taste and photographability. Babas achieves all these things without causing your eyes to roll or your wallet to weep. Two induction burners and one panini press manage to dispatch an efficient yet satiating spread. In the evening, fare is split into apéro (quick nibbles) and à la minute (dishes cooked and served immediately). The components don't tally up to a balanced app-entrée-sides type meal, so don’t expect dinner in the traditional sense—rather, the kind of extravagant snacks-for-supper noshing that inadvertently fills you up. The menu, curated by Crouse, is a collection of best bites across (mostly) Europe, ideal for cocktail hour. Basque notes appear in the woodsy oyster mushroom conserva. 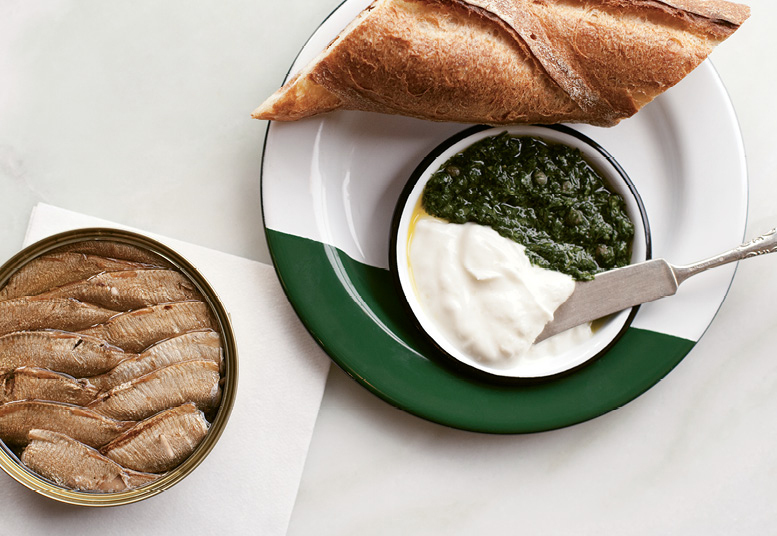 For a detour East to Latvia, opt for the tinned, smoked sprats (small marine fish in the herring family), served with a heaping dollop of labneh and zippy caper verde sauce. French-ish additions, like the grilled cheese, are elevated to delightful spectacle. Slathered with sharp Dijon and melted Gruyère on Brown’s Court brioche, the sandwich arrives encrusted with a corona of frico (crunchy fried cheese); if you’re feeling especially hedonistic, get the surface smattered with Périgord black truffle. Then order the panisse—thick-cut chickpea fries, concocted from a batter of milk, parsley, and chickpea flour—plated in a Jenga-like tower. Each crisp morsel belies a silken, polenta-smooth interior that might compel you to denounce tuber-based frites for good. Pair the panisse, as they do in Provence, with a mineral-forward rosé; or embrace the aperitivo mood by imbibing an Aperol Spritz or Campari Soda, bottled in-house via a handheld crown cap machine. Drinks and food are prepared by a knowledgeable staff, who weave through patrons to deliver your order with earnest alacrity—the same spirit espoused by Edward Crouse, as he mans day-to-night counter operations. The café is a reference to his childhood nickname, “Baba,” which coincidentally bears significance for many people around the globe. A term of endearment, a sweet rum cake, a papa, a grandma, or something even more fundamental (a baby’s first articulations, pleasing gibberish), the universality of Baba extends to Charleston now, too.